Back in 2012, when student email accounts were being migrated to Gmail, we developed a small site at go.olemiss.edu to explain what was happening and to provide instructions. It also linked to the other services that were included in our contract with Google. Before long, we realized this was such an easy URL for people to use that we began linking other services on it including Blackboard and myOleMiss. And that’s the way it stayed until recently–just a little novelty page that needed only occasional updating. And then we decided to include tracking how many people were using it. Turns out, tons of people were using it! This year we saw a spike of over 60,000 pageviews in April. 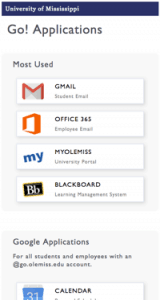 Combining this information with data we had collected from the UM homepage, we could see that a large number of people were using the two pages as jumping off points to get to Gmail, MS email (Office 365), myOleMiss, and Blackboard. Seeing how well these links were doing, we considered how we might highlight additional services like MS applications (that employees have access to) and cloud storage options. Introducing the new and improved Go! website. It includes applications from both Google and Microsoft, along with cloud storage options, and a collection of resources at the bottom that people often have trouble finding when they need them. Those four links that got the most hits have been moved to the top of the page, and the entire page was built with mobile users in mind.